The shoulder is a large and extremely complex joint formed where the, which is the upper arm bone (humerus), fits into the shoulder blade (scapula) like a ball and socket. The most important of the shoulder bones include the acromion, clavicle, and coracoid process. The acromion is a bone that projects off the shoulder blade. The clavicle, or collar bone, joins with the acromion in the acromioclavicular joint. The coracoid process is a boney projection from the shoulder blade. 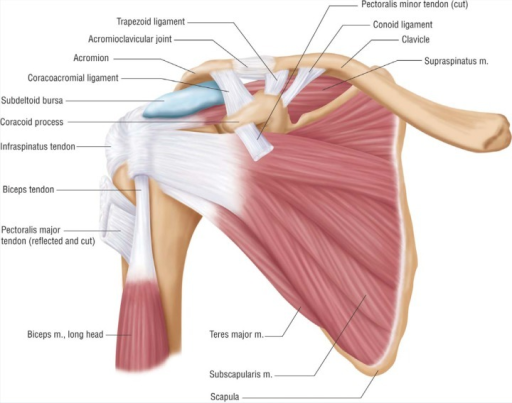 Additional structures in the shoulder include the rotator cuff, bursa, and labrum. The rotator cuff consists of the muscles and tendons that allow us to move our shoulders. The bursa is a sac which acts as a shock absorber protecting the tendons of the rotator cuff. The labrum consists of cartilage that molds like a cup over the round head of the upper arm bone. Probably the most common type of injury to the shoulder is a rotator cuff tear, which is most commonly the result of an acute injury but also can result from long-term repetitive use. Osteoarthritis results from the normal wear and tear that we all develop over the course of our lives, but can be aggravated or accelerated by injury. Shoulder impingement syndrome results when the edge of the scapula presses on the rotator cuff as the arm is lifted. Your shoulder can dislocate when the humerus or other bones of the shoulders fall out of position. Patients with shoulder dislocations often report a "popping" sensation. Shoulder tendonitis results from irritation of one or more of the tendons in the shoulder. Bursitis occurs when the bursa is inflamed. Tears to the labrum can occur from acute injury or overuse. Finally, a frozen shoulder occurs when inflammation develops in the shoulder that causes severe stiffness and pain. As this condition progresses, movement of the shoulder can become extremely difficult and painful. Diagnosing shoulder injuries, like all other conditions, requires a careful physical examination. MRIs, CT scans, and shoulder X‑rays can help in diagnosing shoulder injuries. If you need a Philadelphia shoulder injury attorney, it is important that the lawyer be familiar with the anatomy of the shoulder and the types of injuries that can result. The attorney should also be familiar with the limitations of diagnostic procedures. MRI scans, for example, do not always reveal the existence or extent of a rotator cuff tear. False negatives are common, and often tears can only be found during surgery. The image is reproduced from Seroyer ST, Nho SJ, Bach BR, Bush-Joseph CA, Nicholson GP, Romeo AA - Sports Health (2009). The images are used with the permission of Creative Commons.